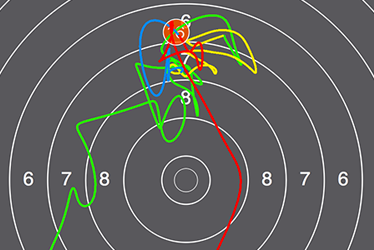 This article aims to interpret the basic error patterns seen in training with a SCATT system. The data provided here relies on years of shooting experience, practical application of SCATT trainers, and coaching. Green (the interval from entering the target up to -1 second before the shot) - allows the shooter to evaluate the direction and nature of the aiming point movement in the initial stage of settling on the center. 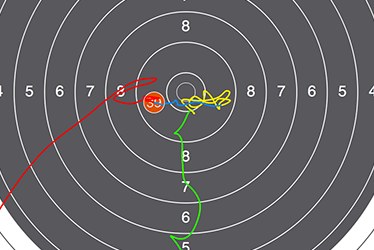 Yellow (the interval between -1 and -0.2 seconds before the shot) - visually distinguishes on the trajectory line the most significant part of the aiming process. Used to analyze the stability and the characteristics of the aiming in general. Blue (the interval from -0.2 seconds up to the shot moment) - this period is equal to the average time of a human reaction to external stimuli. In other words, this is the timeframe in which the shooter is operating the trigger. By the nature and length of this interval, one can judge by how well shooter controls the gun at the moment of the shot. 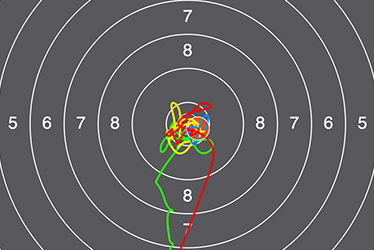 Red (interval after the shot) – follow-through used to analyze the shooter’s aiming point movement after the shot. 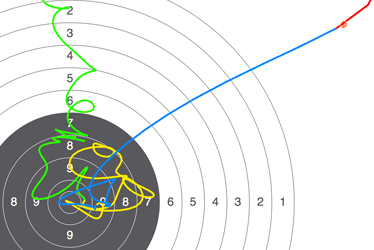 The aiming trajectory has practically no straight segments, a stable hold area (green and yellow lines), smooth (no flinching) processing of the trigger (blue line), the hole is as close as possible to the hold area, and the gun is kept stable after the shot in follow-through stage. The general hold zone and the shot holes are in different parts of the target from shot to shot. At the same time the overall processing of each individual shot may look technically correct. This error can be seen when the shooter is not properly or fully coordinating the position of the front sight to the rear sight, or the shooter is not accurately or consistently positioning the head in relation to the sight. This error occurs when the focus of attention is switched from sight to target or to trigger processing. The error can be characterized by the presence of straight fragments on the trajectory line - uncontrolled movement of the gun relative to the target and as a result displacement of the shot hole relative to the previous hold area. In the above example, we can evidently see that the shooter’s attention was distracted from a careful hold of the gun at the moment of the shot. An error caused by a sharp, jerky movement of the hand at the time of the shot. It is characterized by the presence of a straight section on the trajectory immediately before the shot (the blue line), can be seen in the interval from 0.2 to 0.1 seconds before the shot. 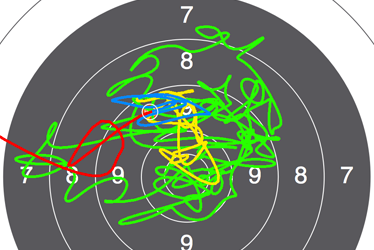 In this case, the shot hole splits away from the hold area and in extreme cases (see image) can be located very far from center. This error can occur even with experienced shooters. It is characterized by a long (more than 12 seconds) aiming time, which can lead to fatigue of attention, loss of focus on sights and as a result a slow displacement of the shot hole on the target. The optimal time for shot processing is considered to be an interval of no longer than 8-10 seconds. Errors in shooting are usually caused by a combination of several factors and are rarely found in pure form. For example, the shooter cannot focus the eyesight on the gun sight and as a consequence - the finger does not press the trigger, 8-10 seconds pass ("a delayed shot"), the eyes and hands are tired, the sights become blurry, the shooter switches attention to trigger to quickly finish the shot, increases the effort and speed of its movement. This kind of shot preparation can lead to a miss or, at best, a shot distant from the group and the center of the target.